My Grandma Jones and my mother gave me all the basic cooking training I have used throughout my life. People uninitiated to cooking seldom realize, until they try to do something in the kitchen, that there are certain given truths to the techniques involved in cooking. When I was little, three or so, I started my cooking life, and those little truths of cooking came from the kindly training these two women gave me. My Grandma McCollaum was a FANTASTIC cook, and I am told I cook much like she did, but she never taught me cooking. Though a professional teacher, cooking was one of her vanities, and an art form reserved to mighty and grown women. It was not the province of “snot-nosed” children, and for that reason the only work I remember doing in my Grandma McCollaum’s kitchen is dish washing twenty plates in three ounces of water, but that’s a story for another day. Today I tell the story of “Popcorn Balls.” Does anybody remember these? Does anybody make them anymore? My Grandma Jones made them. My mom did, too. People used to give them out on Halloween, but no more. Too much fear of “unsafe” treats. Yep. Halloween used to be an exploration of home cooked specialties–caramel apples, sugar cookies shaped to look like Jack-O-Lanterns, fudge, and popcorn balls. It wasn’t until after my few years of going door to door that all families began to opt for the safe version of factory produced sugar-shock wrapped in plastic. I feel sorry for kids today, sometimes. For Christmas, Grandma Jones would send us popcorn balls. She would dye them red and green. It had been so long since I had popcorn balls, I began to feel nostalgic for them the other day. 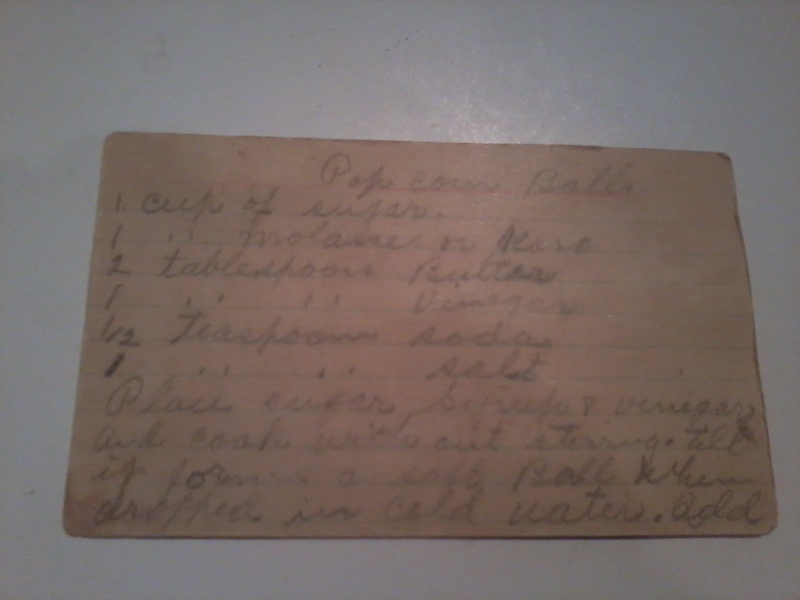 I looked in my old recipe box, and I found Grandma Jones’ very recipe. Written in pencil on a yellowed index card. 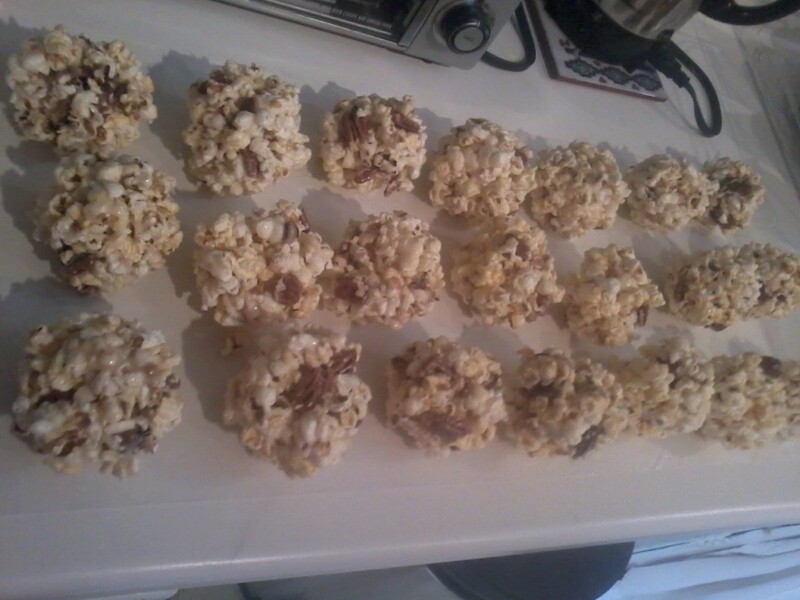 Today I made my own version of these popcorn balls. They aren’t quite what I remembered, but they are good. They are tasty. First, I popped the corn. Now, in Grandma’s day, we popped a couple of pans full on the stove top. For this recipe I popped three bags of the Pop Secret Extra Butter popcorn. I picked through it to take out the “old maids.” That’s the term people once used for the un-popped kernels of corn, and I only thought today about what a gross term that is for un-popped kernels of corn. Old maids? Just consider what it’s intended to refer to! Old maids… Anyway, take them out. I added to this about cup of toasted pecans. I added the pecans because we have them, and I like the flavor of them. 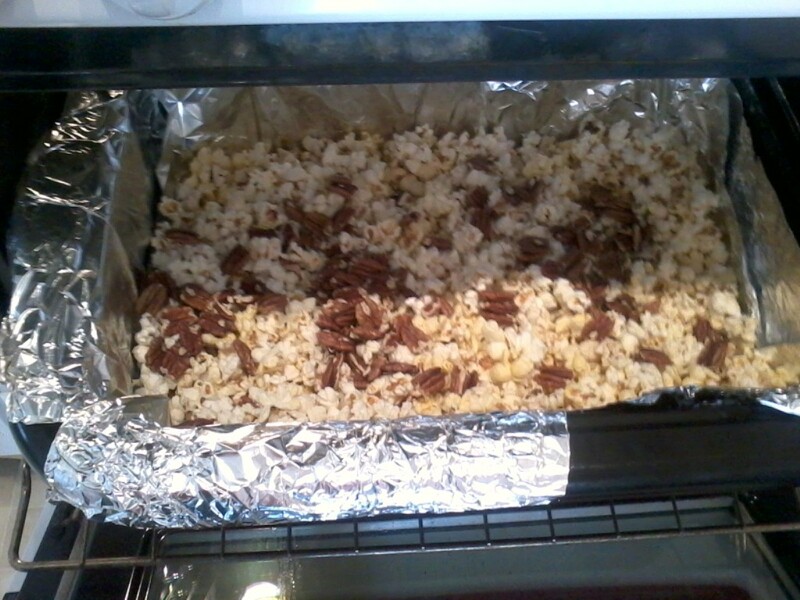 You have to keep the popcorn warm in the oven in a lined roasting pan until you have the candy to pour over it. There’s something not in the recipe. You should not pour the hot candy over cold corn. It will cool too fast to shape into balls. Seriously, old maids? Why? Because they were “never popped.” See what I mean. Gross. Keep warm in a 200 degree oven. 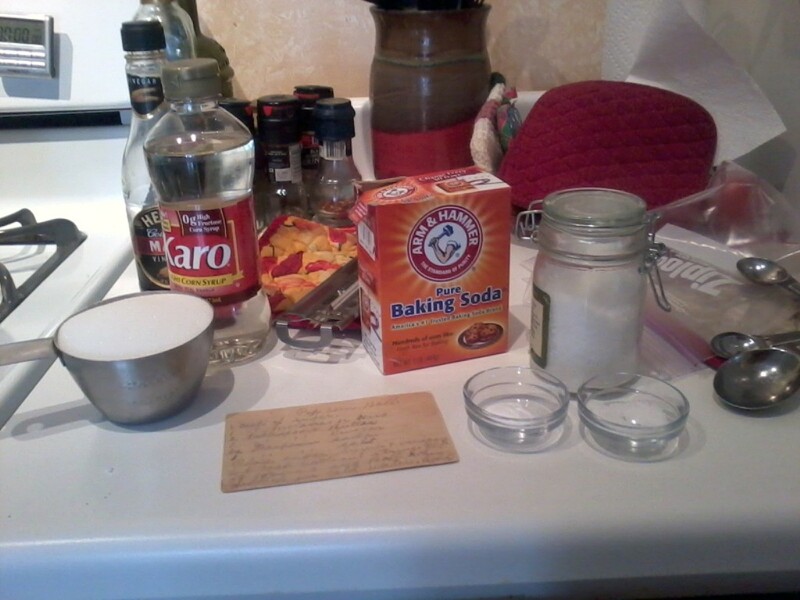 The recipe calls for one cup of sugar, a cup of Karo (or molasses), a tablespoon of vinegar, 1/2 teaspoon of soda, a teaspoon of salt, and about two tablespoons of butter. (Throw the salt over the popcorn.) Combine the first three items in a pan and heat to soft ball stage. I have actually done this many times in my life, tested candy in cups of cold water. That’s how my Grandma Jones did it. You put the mixture over medium heat and wait until it’s bubbling for about five minutes. DO NOT STIR IT WHILE IT IS COOKING. You will need to test the candy several times to make sure it’s at the right stage. The truth is candy making is a B****. 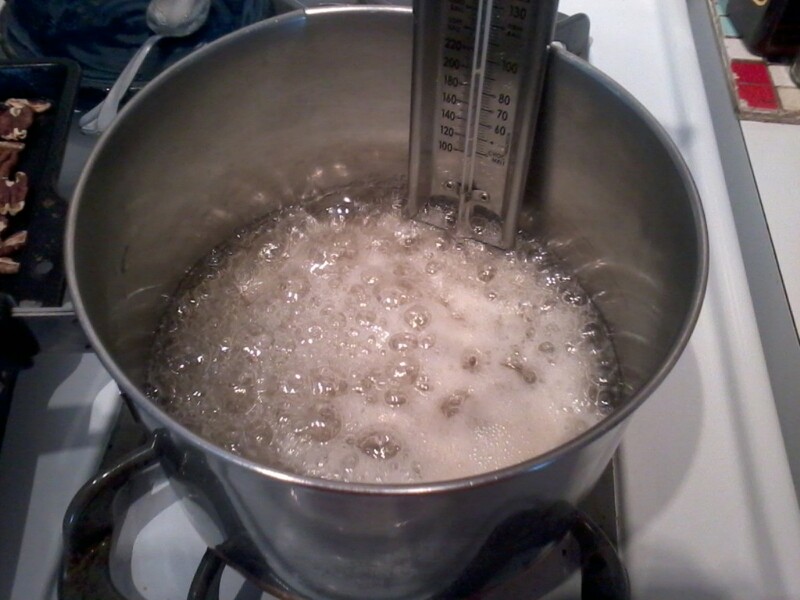 Several years ago I bought a candy thermometer. It was worth every penny. It has the soft ball stage marked right on it. When it reaches the right temperature, turn the heat off and add the soda. The soda will make the stuff cloudy and fill it with air. You pour it quickly over the popcorn and fold the candy over and around the popcorn. It’s hard to describe. Butter your hands next. Grandma Jones let me help with this part. She got my hand and COVERED them with butter then warned me quite clearly that the hot candy was still VERY HOT, and I needed to be cautious as I handled the mixture. Plenty of smother mothers today would probably avoid doing this. It IS a risk, but I watched Grandma Jones do it, and I learned to respect the process without getting badly injured. She was that kind of woman. She watched over us, but she did not keep us out of life. She did not lock us inside if there were rattlesnakes in the area. She taught us how to chop their heads off, cleanly and with courage. That’s what real living is all about. You have to get in the game. Anyway, here are the popcorn balls I made. Twenty-one in all, they’re about three inches in diameter. There are lots of details of cooking that are often left out of recipes. The assumption of the author is that the cook reading will KNOW certain things, even before she begins. I am truly thankful for all the certain, secret things my Grandma Jones and my mother taught me. The knowing has a value beyond what shows here. As Edna says, “Luck favors the prepared.” I feel lucky to have the ability to turn to the pantry and make something historic and fun, sweet and salty and good to eat. This entry was posted in Uncategorized and tagged nostalgia, Old maids, Popcorn balls, sweet and salty. Bookmark the permalink.